The Candyrific brand encourages you to play with your food and eat it too. This unique brand has combined elements of fun and playtime with tasty and interactive treats that kids will love. 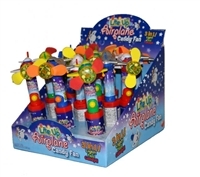 Our fun candy toys come in different designs including a colorful potted flower and an airplane ready to take flight. To enjoy hours of play time, simply press the button and watch as the propeller and flower petals light up and become a fan. Each bulk light up candy set comes with 12 individual pieces, making them a fun, affordable party favor to put in kid’s goody bags. Shop bulk Candyrific candy at The Wholesale Candy Shop to save money on a candy that will provide hours of entertainment. Order today!